Can you perform a robust histopathological diagnosis for this unusual case? An 81-year-old woman presented to the emergency department because of a recent sharp pain in the left hemithorax and a history of recurrent lower respiratory tract infections. She had been treated with antibiotics twice during the last month before presentation. She was a never-smoker with a previous history of depression and complete thyroidectomy for a nontoxic multinodular goitre. Physical examination was within normal limits. Oxygen saturation was 94% while breathing ambient air. Biochemical testing showed an elevated white blood cell count (14.33×109 cells·L−1; normal range 4–10×109 cells·L−1) and an elevated C-reactive protein level (118 mg·L−1; normal level ≤5 mg·L−1). 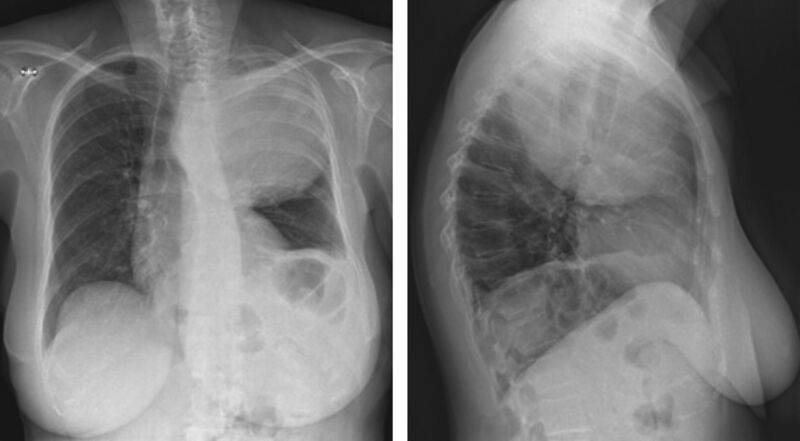 A chest radiography was performed (figure 1). Which of the following is present on this chest radiograph? c) The chest radiography revealed a large space-occupying, pulmonary mass with secondary contralateral tracheal shift and caudal displacement of the left main bronchus. A computed tomography (CT) scan (figure 2a) confirmed the presence of a large, spherical structure occupying the left upper lobe. The lesion was characterised by a heterogeneous appearance and a pronounced contrast enhancement of its outer wall. 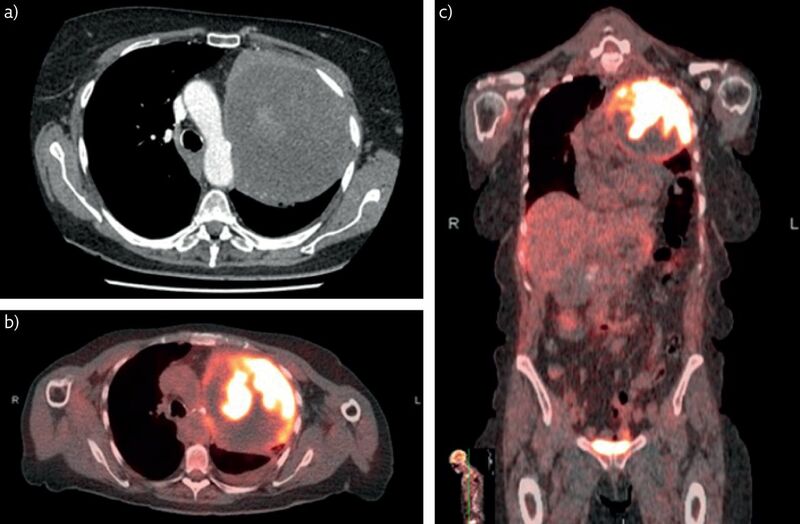 Positron emission tomography (PET)/CT with 18F-fluorodeoxyglucose (18F-FDG) (figure 2b and c) demonstrated intense and heterogeneous 18F-FDG uptake (maximum standardised uptake value (SUV) 19.81; ratio of mean SUV of viable tumour/liver of 5.62) with a notable hypometabolism in the lesion's centre and caudal part. a) CT scan and b, c) 18F-FDG PET. What would now be your preferred diagnosis? c) The aggressive, subacute presentation of a pulmonary mass causing incapacitating pain, recurrent lower respiratory tract infections and considerable biochemical inflammation in this 81-year-old woman was particularly suggestive of malignancy, even without history of nicotine abuse. Which examination would you like to perform to confirm your diagnosis? When malignancy is part of the differential diagnosis, a robust histopathological diagnosis is required. Consequently, a bronchoscopy was performed to obtain biopsy specimens (figure 3). A complete occlusion of the left upper lobe bronchus was seen. This occlusion did not appear to be caused by an endobronchial lesion, but rather by an extrinsic compression of the bronchial lumen. Tissue samples were taken. Histopathological examination showed a normal bronchial wall, with a small part of the epithelium being infiltrated by neutrophilic granulocytes. d) Given a context of probable malignancy, we preferred performing a transthoracic biopsy, with specific attention to target an 18F-FDG-avid part of the mass, since solid diagnosis was still lacking. Histopathological examination (figure 4) showed a tumoral proliferation consisting of plump to very large cells with pleomorphic and hyperchromatic nuclei, multiple mitotic figures and foci of necrosis. In the background, osteoclast-like giant cells were recognised. Immunohistochemistry (figure 5) revealed expression of desmin and smooth muscle actin (SMA), in the absence of keratins, thyroid transcription factor-1, p40, S100, murine double-minute type 2 and myogenin. 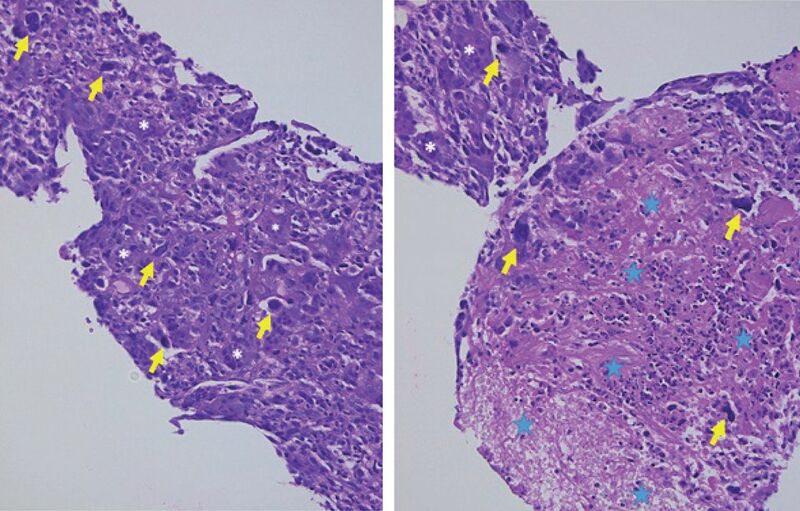 Haematoxylin and eosin stain, showing a cellular tumour, some cells of which have hyperchromatic nuclei (yellow arrows). The white asterisks correspond to osteoclast-like giant cells; the blue ones indicate an area of necrosis. Strong expression of desmin in the tumour cells. What would be your final diagnosis? d) The positivity for desmin and SMA, in the absence of the other markers, points to a diagnosis of leiomyosarcoma. 18F-FDG PET/CT did not show any distant metastases and an additional CT scan of the head excluded brain lesions. What would be your preferred treatment strategy for this 81-year-old symptomatic patient? a) Since a primary pulmonary leiomyosarcoma (PPL) usually presents as a single lesion with limited radio- and chemotherapy sensitivity, surgery is the most appropriate treatment option [1, 2]. In the current case, after having considered the risks of major surgery, our patient finally opted for palliative care. 3 months after the initial diagnosis, she passed away. PPL is a rare type of pulmonary neoplasm, accounting for <0.5% of pulmonary malignancies. It is the most prevalent pathological subtype of pulmonary sarcomas, originating from smooth muscle cells of the pulmonary interstitium, bronchi and blood vessels [3–5]. PPL generally presents with mild, nonspecific respiratory symptoms, but can also remain asymptomatic for a considerable time . The radiological appearance can be variable, although imaging usually reveals a well-defined, intraparenchymal, spherical mass . Bronchoscopy rarely demonstrates an endobronchial lesion; however, when the mass is bulky, extrinsic compression can be seen. Generally, light microscopy does not yield a confident diagnosis, since a number of similar spindle cell tumours are difficult to differentiate morphologically. Consequently, immunohistochemistry is of major importance and frozen section examination has only limited value. As demonstrated in our patient, leiomyosarcomas commonly test positive for the conventional markers SMA and desmin, while they are negative for epithelial markers (cytokeratin, carcinoembryonic antigen, etc.) [7, 8]. Diagnosis of PPL is impeded by three important issues. 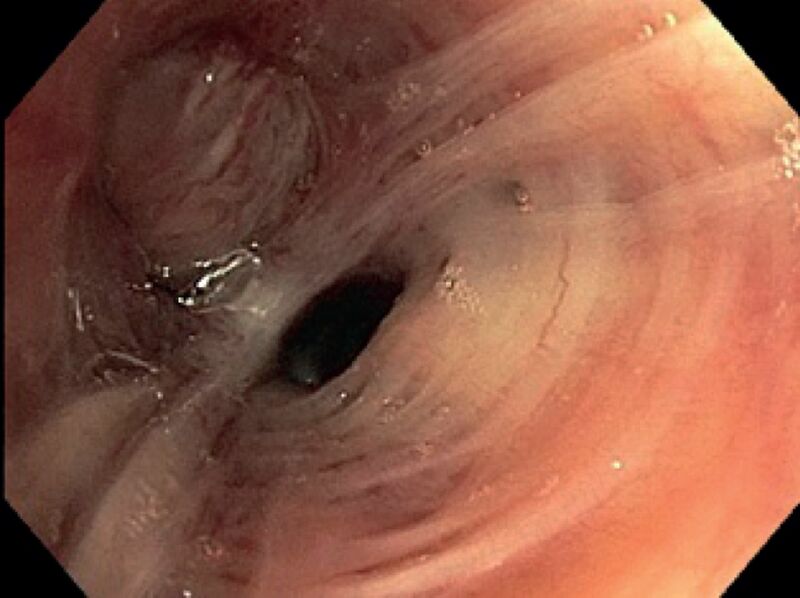 First, it appears difficult to obtain an early-stage diagnosis because of the nonspecific presentation and the absence of exfoliation, reducing the potential diagnostic yield of bronchoalveolar lavage and brushing. Secondly, often pathological diagnosis is not fully straightforward, demanding a complex immunohistochemical staining [1, 7–10]. Thirdly, one should bear in mind that the vast majority of pulmonary sarcomas is metastatic, originating from uterine, gastro-intestinal or soft tissue sarcomas. Consequently, the diagnosis of PPL should only be made after having performed a systemic screening in order to rule out an extrapulmonary primary location . In this case, this was done through the use of18F-FDG PET/CT. The intense 18F-FDG avidity of the pulmonary mass in the absence of other lesions excluded an alternative origin. Basically, surgical resection is the preferred treatment strategy for PPL [1, 11–13]. Still, this approach consists of an extensive procedure, encompassing lobectomy or pneumonectomy and resection of the affected surrounding tissue, such as diaphragm, vascular structures and/or part of the chest wall . In case of incomplete resection or prior inoperability, adjuvant or palliative radio- and chemotherapy are recommended, although survival benefit has not been established for these treatment modalities [1–3]. Recently, stereotactic ablative radiotherapy has been suggested to be a valuable alternative for surgery for small lesions in medically inoperable patients, although robust evidence is still lacking . Results of conventional radiotherapy appear to be inferior. Standard chemotherapy regimens usually contain doxorubicin, although recently potential benefit of new drugs (for example pazopanib) has been suggested [16–18]. Nevertheless, in general, prognosis remains poor. The median survival of PPL is 14 months. The overall survival at 1 year is 52.7% and at 5 years 22.2%. The main prognostic factors are the histopathological grade and the possibility for surgical management, which improves the overall survival by almost 29 months, resulting in a 5-year overall survival of >50% . Not all pulmonary nodules or masses are of epithelial origin and, although rare, primary mesenchymal tumours such as leiomyosarcoma can originate in the lung. Consequently, a robust histopathological diagnosis is essential in the context of clinical suspicion of malignancy. 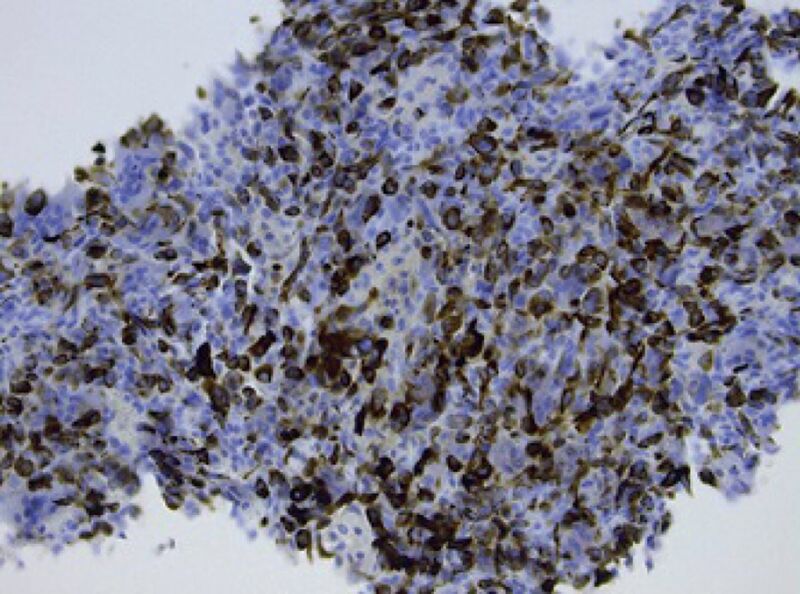 PPL diagnosis is hampered by a nonspecific presentation, absence of exfoliation and need for advanced immunohistochemical staining on biopsy specimens. When identifying a pulmonary sarcoma, systemic screening for an extrapulmonary primary location is required. Surgical resection is the preferred therapeutic approach, although prognosis generally remains poor. Conflict of interest: H. Bode has nothing to disclose. Conflict of interest: R. Sciot has nothing to disclose. Conflict of interest: E. Werbrouck has nothing to disclose. Conflict of interest: E. Geusens has nothing to disclose. Conflict of interest: C.M. Deroose reports consultancy fees from Bayer, Sirtex, Novartis Pharma and Advanced Accelerator Applications (AAA), and advisory board fees from Ipsen, Novartis Pharma and Terumo, all outside the submitted work. Conflict of interest: K. Nackaerts has nothing to disclose.
. Primary pulmonary leiomyosarcoma: a population-based study. Lung Cancer 2018; 116: 67–72. Primary pulmonary leiomyosarcoma: a case report. Oncol Lett 2016; 11: 1807–1810. Primary sarcoma of the lung: a clinical study with long-term follow-up. Ann Thorac Surg 1994; 58: 1151–1155.
. Bronchopulmonary leiomyosarcoma and fibrosarcoma. A study of 32 cases and review of the literature. Cancer 1972; 30: 836–847.
. Rare pulmonary neoplasms. Mayo Clin Proc 1993; 68: 492–498. Radiologic findings in primary pulmonary leiomyosarcoma. J Thorac Imaging 2000; 15: 151–152.
. Primary sarcomas of the lung: a clinicopathological and immunohistochemical study of 14 cases. Histopathology 1996; 29: 29–36. Primary pulmonary leiomyosarcoma of lung: an unusual entity with brief review. Indian J Pathol Microbiol 2015; 58: 338–340. Primary pulmonary and mediastinal synovial sarcoma: a clinicopathologic study of 60 cases and comparison with five prior series. Mod Pathol 2007; 20: 760–769.
. Diagnosis and management of primary pulmonary leiomyosarcoma. J Am Osteopath Assoc 2010; 110: 244–246.
. Leiomiosarcoma pulmonar primario [Primary leiomyosarcoma of the lung]. Arch Bronconeumol 2010; 46: 338–339. Surgical treatment of primary pulmonary sarcomas. Eur J Cardiothorac Surg 1999; 15: 456–460. Primary pulmonary sarcomas and carcinosarcomas – postoperative results and comparative survival analysis. Eur J Cardiothorac Surg 2003; 23: 461–466. Fine needle aspiration biopsy of primary leiomyosarcoma arising from a pulmonary vein. Acta Cytol 1999; 43: 523–526.
. Primary lung sarcoma treated with stereotactic ablative radiotherapy: a case report. Onco Targets Ther 2017; 10: 3285–3288. Doxorubicin-based chemotherapy for the palliative treatment of adult patients with locally advanced or metastatic soft tissue sarcoma. Cochrane Database Syst Rev 2003; 3: CD003293. Pazopanib for metastatic soft-tissue sarcoma (PALETTE): a randomised, double-blind, placebo-controlled phase 3 trial. Lancet 2012; 379: 1879–1886. Eribulin versus dacarbazine in previously treated patients with advanced liposarcoma or leiomyosarcoma: a randomised, open-label, multicentre, phase 3 trial. Lancet 2016; 387: 1629–1637.